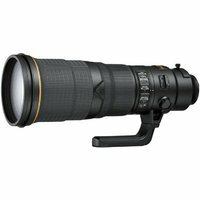 The Nikon 500mm f/4 VR prime is the world's lightest super-telephoto lens compatible with both FX-and DX-format digital SLRs. Featuring an improved Vibration Reduction (VR) image stabilisation system with an effect equivalent to 4.0 stops, plus two fluorite lens elements to keep the weight down and better AF tracking for continuous shooting of moving subjects, this lightweight, robust lens is quicker, more versatile and almost 800g lighter than its predecessor. A new Electromagnetic Diaphragm Mechanism also enables stable auto-exposure control. Perfect for shooting subjects at a distance, such as sport and wildlife.